An image of Chestnut Creek Falls located on the New River Trail near Fries Virginia. Captured: July 29, 2017 @ 8:03 p.m. Although it’s not the tallest waterfall in the world, Chestnut Creek Falls offers a fantastic view of the countryside, and it’s certainly worth the journey. A must see for anyone willing to venture out on an easy one-mile hike. Located on the New River Trail near Fries Virginia, Chestnut Creek Falls awaits your arrival. What makes Chestnut Creek Falls worth the trip? The New River Trail spans 57 miles passing through several counties by way of a long-forgotten railroad route formally known as the Cripple Creek Extension. Now converted from rails to trails, the New River Trail runs parallel to Chestnut Creek. However, after crossing the New River in Fries Junction, the trail then runs along the river until the last several miles before reaching Pulaski. The trail holds many stunning photographic opportunities along its breathtaking route and welcomes hikers, bicycles, and horseback riders. Relax and enjoy my travel photography tips and advice while you prepare to transit the New River Trail. Also, take a moment and tour my other images of Chestnut Creek Falls at my gallery on Fine Art America. A beautiful journey and an easy hike. Before I first set out to explore Chestnut Creek Falls, I struggled to find relevant and worthwhile information to aid in preparing for my visit. After a bit of research, I found a fellow photographer that was kind enough to point me in the right direction. In fact, after arriving at the Chestnut Yard parking area, I wasn’t entirely sure of the precise location of Chestnut Falls. However, I merely followed the New River Trail upstream, and after a short one-mile hike, I arrived with no trouble. Starting from Chestnut Yard, head south-east upstream and you can’t miss it! For the technologically savvy, the following GPS coordinates will guide you to the falls: N36° 42.964′ W80° 54.555′. Along the voyage, you’ll find the river is easily accessible from many points. The views are spectacular, complete with the sounds of a raging river and a scene only Mother Nature can provide. Ordinarily, most state parks have sufficient parking; however, it seems the more isolated an area, the more limited the parking. Fortunately, Chestnut Creek Falls is accessible from not one, but two reasonably close parking lots. My first choice is Chestnut Yard on Iron Ridge Road, GPS location: N36° 43.382′ W80° 55.017′, and it’s less than a one-mile hike to the falls. Second, Dannelly Park, GPS location: N36° 41.708′ W80° 54.979′, is a two-mile hike but offers a larger parking area with more security. Sadly, like many parks, New River Trail State Park charges a $5 fee for parking. However, it’s only five bucks and well worth the expense. In fact, the fee grants all-day entrance into any area of New River Trail State Park. See the park map for various locations. Covered picnic table at the site. Located just above Chestnut Falls on the hilltop, a covered picnic table provides an excellent opportunity for a family picnic or a quick snack. Honestly, I used the table to store some gear while I scouted the area for my composition. In addition to providing a bit of shelter from the elements, the table extends an opportunity for a quick intermission while you enjoy the fantastic overlook of the river. Nearby camping is always a good thing. There are four official primitive campgrounds in the park: Cliffview, Millrace, Baker Island, and Double Shoals. I’m sure any will provide adequate primitive accommodations for an avid camper. Additionally, each site includes a fire ring, picnic table, and access to the river. The campsites also have nearby non-flush toilets. However, I discovered that many people camp at unofficial sites along the trail; though I prefer to follow the park rules. In any case, Cliffview is the closest campsite to the falls and has running water, except during the winter months. Check with the park services for specific camping requirements. Reasonably priced quality hotels within 15 minutes. Although a bit pricey for the area, the Hampton Inn in Galax is the closest and is only about a 15-minute drive to the parking area at Chestnut Yard. On the other hand, the Motel 6 in Hillsville is neat, very clean, and much more on the economic side. Having visited the Galax and the Hillsville areas on many occasions, I have stayed at both hotels with no complaints. Also, if you’re willing to travel an additional 40 minutes, Mt. Airy in North Carolina has several excellent hotels including numerous restaurants and other amenities. Furthermore, if you’re an RV entrepreneur, you’ll be pleased to know that Fries New River RV Park is within 15 minutes of Chestnut Yard. In fact, Fries RV park provides free wi-fi, cable TV, and full hotel amenities with 20, 30, and 50 amp service at each site. The New River Trail is open to a variety of traffic. Open to bicycles, foot traffic, horses, and pets, the New River Trail is quite versatile. However, the trail appears mostly used for bike riding. Nevertheless, the trial is extensive, well-kept, and capable of handling high volumes of traffic without overcrowding its occupants. Fortunately, or unfortunately, depending on your point of view, the park prohibits motorized vehicles. Don’t get me wrong, I too enjoy an outing on an ATV as well as anyone, but I also enjoy the sounds of nature without the background noise. December to February: 7 a.m. – 7 p.m.
March, April, and October: 7 a.m. – 9 p.m.
May to September: 7 a.m. – 10 p.m.
November: 7 a.m. – 8 p.m. Chestnut Yard parking lot has the potential for theft. Indeed, I’ve used this parking lot several times without incident. Though, that doesn’t mean I’m not concerned with theft. In fact, there’s a nearby house on the other side of Iron Ridge Road, but sadly, it doesn’t have clear sight of the parking area. Regardless, the tiny isolated lot resides exceedingly close to the main road supporting only four or five mid-sized cars. Remember, this is an official New River Trail State Park designated parking area, so don’t forget to bring five dollars cash for the parking fee. Park with caution! Chestnut Creek Falls has no restrooms. According to information provided by park services, the New River Trails maintains eight restrooms and five no-flush toilets; unfortunately, none are near the falls. Critters on the trail can make you nervous. Admittedly, given enough time, anything is possible. Although in this region, I think the likelihood of a savage attack is highly improbable. According to park services, black bear encounters are rare. Honestly, after traveling the New River Trail on many occasions, I’m yet to meet a critter more fierce than a small bat; although, you will almost certainly encounter a deer in your travels. In any event, there’s nothing wrong with keeping your eyes open for something more threatening than a deer or more ferocious than a bat. Despite the trail’s smooth terrain, wear comfortable shoes. Regardless of one’s intentions, whether it’s to capture an award-winning image or just enjoy a pleasant hike, I always suggest wearing quality shoes. In fact, nowadays many people wear flip-flops for a variety of activities. Still, as a landscape photographer, I fancy the support and security that accompany quality hiking footwear. Be that as it may, flip-flops or tennis shoes are more than adequate for this trail. Also, to get the best photographic perspectives, you may even ponder the need for a pair of wading boots to cross the creek. As I mentioned earlier, people sometimes cross the New River Trail by horseback. With this in mind, one need only imagine the likely minefields that lay ahead. Therefore, it’s wise to keep your eyes open for horse manure. Then again, a real nature lover rarely concerns themselves with such trivial affairs; although that’s a matter of opinion. Nothing beats an early morning at Chestnut Creek Falls. 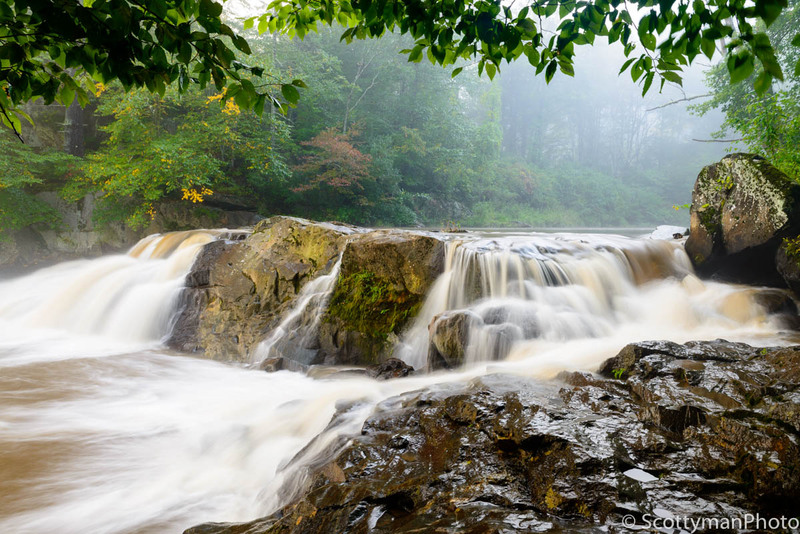 A foggy morning image of Chestnut Creek Falls on the New River Trail near Fries Virginia. 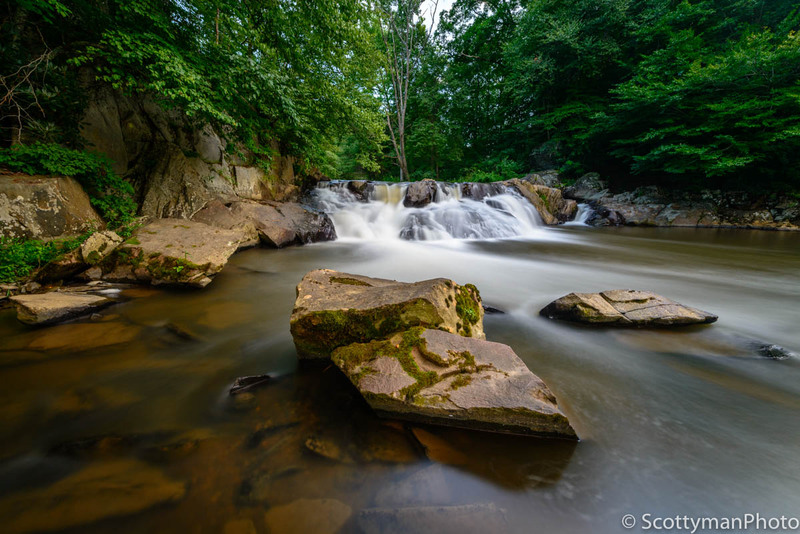 Regardless of whether you’re a morning or evening person, Chestnut Creek Falls a capable of yielding an award-winning image any time of day or night. In any event, if your schedule permits, I recommend both morning and evening excursions to the falls. But if I could only go once, morning is the clear winner. Best lighting for shooting the falls. In my opinion, the evening light provides the best illumination and warm color for photographing the falls. On the other hand, the cold mountain air in the mornings may just add a little mystery to your image. Of course, it’s your composition. Take a moment and read my Philosophy. Pack a snack and always bring water. Imagine venturing out on the trail for a quick pic. However, it’s a beautiful day and the potential for a fantastic evening sky unfolds before your eyes. Now your plans include staying until after sunset; but sadly, you realize you didn’t pack any food or water. Nonetheless, I recommend carrying an energy bar in your bag. In fact, many energy bars have an enormous shelf life, just toss it in your camera bag and forget it.